a) SpeakApps Cloud: This mode allows the use of the SpeakApps tools from the cloud and includes a Learning Management System (LMS) Moodle. b) SpeakApps Plug-in: This mode allows the integration and use of the SpeakApps tools in the educational platform of the client, provided that it is compliant with the IMS LTI specification. I. Standard Service: This service guaranties the clients’ access to the most stable versions of the tools and the educational platform. Standard service does not include the either customization of graphics nor any ad hoc adaptations or customized developments. Other exclusions: monitoring services, client access to backups, individual support service. II. Premium Service: This service includes the coverages described in the Standard service. It also includes support in the configuration and the set up of the tools and the educational platform. It also allows customization (logo and corporate image of the client) and updates of tools and the educational platform. Other services included: monitoring services, periodic reports, client access to backups incidences, individual support service and the possibility contracting ad hoc developments. Servers SpeakApps tools will be installed on servers managed by FUOC that could be accessed via cloud computing. Service Availability SLO: 99,5% (percentage of monthly service with 24×7 availability, excluding planned service interruptions). Problem-solving FUOC is committed to make its best efforts to resolve incidences within 48 hours on weekdays and 72 hours on weekend or holiday. SLO: 90% problem solving in the defined timeframe, annually measured. - Administration of servers and cloud services (virtual machines, databases, release updates, etc.) and connectivity to the Internet. - Correction of errors (under specifications). 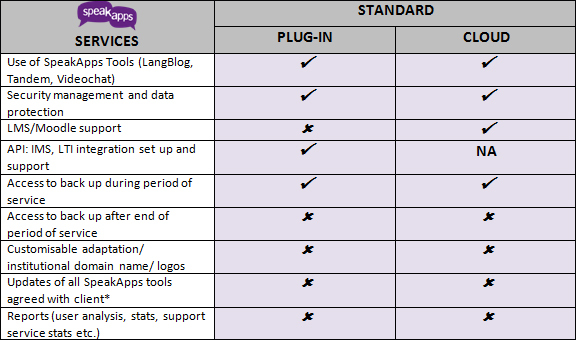 - Correction of plug-in errors in the integration of SpeakApps tools (in the clients’ LMS). - Security management and data protection. 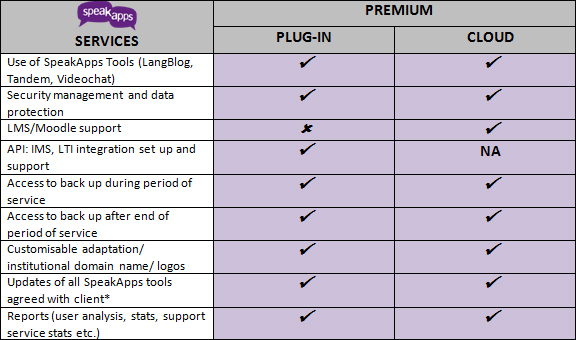 - SpeakApps tools release updates (determined by provider). - Services described in SpeakApps Plug-in. - Super-Admin of the LMS. - Management of administration users ( virtual classrooms and LMS). - LMS release updates (determined by provider). - Problems on the client’s LMS. - New features and additional plug-ins. - Errors in hosting servers (e.g. Amazon). - Support on content creation and management in the LMS. Severity Levels FUOC will determine the severity level of the incidence together with the client and will jointly set the deadlines for its resolution. Servers SpeakApps tools will be installed on servers managed by FUOC that could be accessed via cloud computing services exclusively for the client. Service availability SLO: 99,5 % (percentage of monthly service time with 24×7 availability, excluding planned service interruptions). Problem-solving FUOC is committed to make its best efforts to resolve incidents within 48 hours on weekdays and 72 hours on weekend or holiday. - Support on installation and configuration of the SpeakApps tools. - Support on content creation and management in the SpeakApps tools. - Release updates of SpeakApps tools agreed with the client. - Request of read access to servers and data by the client. - Release updates of LMS agreed with the client. Client data Backups Daily client data backups for internal management of the tools and the educational platform. The client can request access to those backups.